Please be aware there is only entry to our office from the Westbound side of East Genesee Street. If you are arriving from the Eastbound side of East Genesee Street, we recommend: 1) Drive past our office (will be on your left) 2) Take 481N entrance, stay in right lane (DO NOT GET ON 481N) 3) Take 3W exit to 5W (E Genesee St) 4) Our office is now on your right side, enter the first driveway If you need any help with directions please contact us prior to the appointment, we will be glad to help. 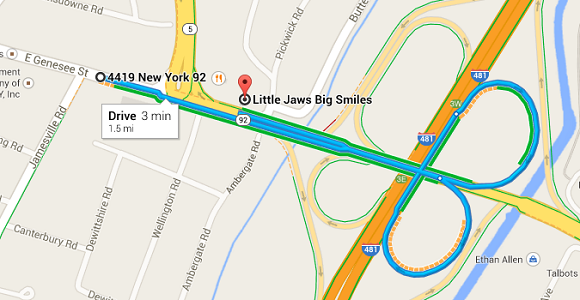 Copyright © 2012-2019 Little Jaws Big Smiles. All Rights Reserved.